Are you looking for quality assurance seminar guides, continuous improvement ideas, on-line training with certifications, or ISO implementation tools? Please book mark us! We update the site regularly. Feel free to contact us for your QA needs. Sign up for the RSS feed for continuous updates. 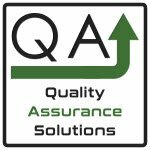 Sign up for the QA Solutions E-zine. I will cover your requested topics in the E-zine. If you can't find your desired information send me an email. If you want to discuss anything QA or discuss this website send me an email. Your Quality Assurance Seminar starts here.